At the end of yesterday’s post, I made mention that I would be spending the evening at the gym taking a few classes with my Momma and best pal Brittney and her husband. I’m kinda obsessed with taking group fitness classes so I was shocked to hear that she had never taken a group fitness class before. When you are as awesome and adventurous as us… you go big or go home so Brittney did two in a row! We made sure to get to the gym extra early with plenty of time to show them around the gym as well as do a little warm up. I was so happy that Brittney and Cameron got to see where Momma and I spend so much of our time. Once up on the fitness floor, Cameron hit the treadmill, Momma hit the bike, and Brittney and I walked our way around the indoor track and got to catch up for a quick minute. Just as we were about finished with our mile warm up, Bryan joined in. We still had some time left before we had to head to Body Combat so the four of us gathered in a stretching hallway and did 10 sets of 10 push ups. Like I said, go big or go home. Originally it was only supposed to be just us girls going to Combat but we twisted Cameron and Bryan’s arm into joining us. We stood in the middle so they could see the instructor fairly well and before we knew it we were out of breath and sweating. Combat is one of my favorite classes at the gym and I always feel super motivated during class to push my hardest and step out of my comfort zone. Every time I looked at Brittney during class she was doing the moves on point and looking like a pro! For someone who just took their first fitness class, she sure did pick it up fast. It makes me happy to see anyone (especially those close to me) try new things and really push themselves. The hour went by incredibly fast and my legs were just about jello walking down the stairs to spin class. There was a double booking on the spin studio so instead of it just being members of Biggest Winner team and the local news station, it was also a triathlon class. We all set up camp near the back of the room and got to moving. Unfortunately, Brittney got sort of a dud bike so Bryan hopped off in the middle of class and set her up with a new one. 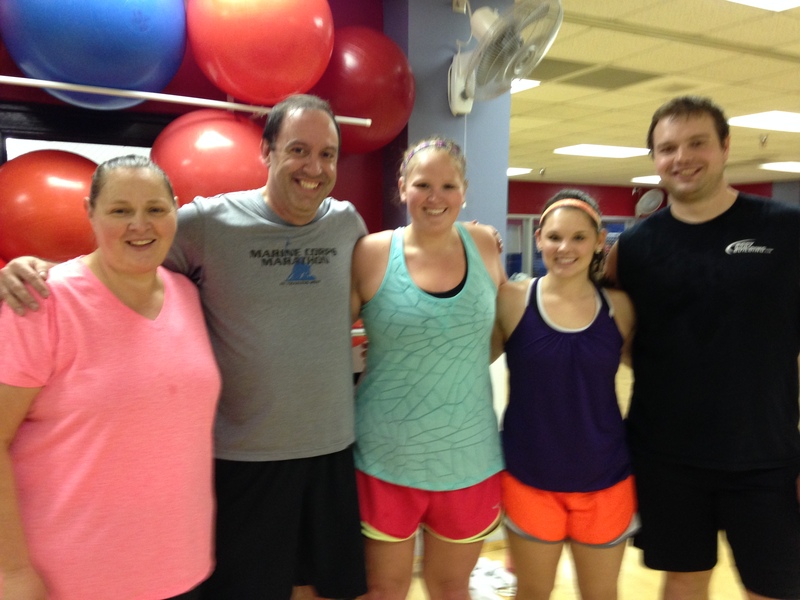 Since the triathlon class had started prior to Biggest Winner team arriving, the class was cut short for some of us. 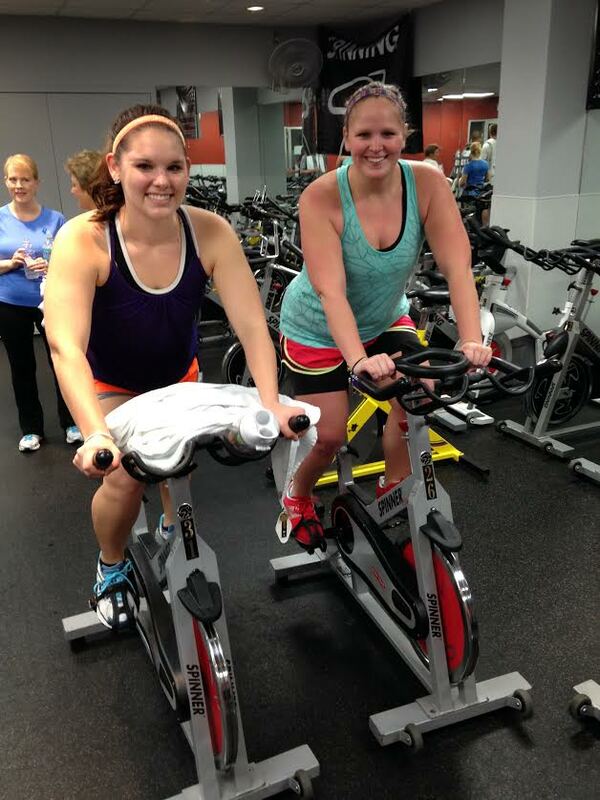 We didn’t mind though since our quads were on fire for the 40 minutes that we were in spin. Joe Mitchell, former Biggest Loser contestant, was our instructor and earlier this week he set up a way for all of us to request a song to be played during class. It was fun hearing everyone’s selections during the ride and made it a little more personal. Last night was a fantastic workout and my body sure was feeling it this morning. I’m so proud of my Momma for taking back to back classes, proud of Bryan and Cameron for stepping up and taking a class with the ladies, and for Brittney taking her first ever fitness classes and ROCKING them out! I’m so thankful to be surrounded by friends who have such a positive and healthy mindset and that we can constantly encourage each other to go the extra mile (pun intended) and reach for our goals and to not be scared of them. 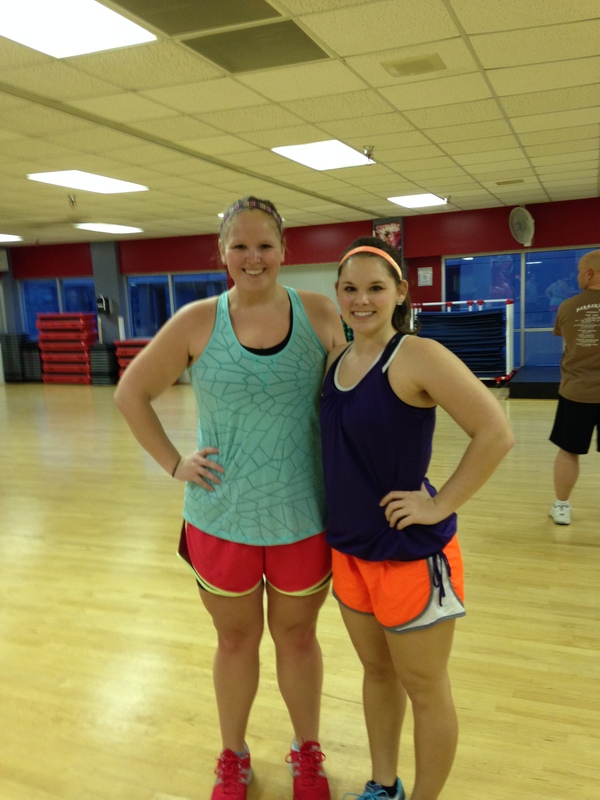 I can’t wait for Brittney to take more classes in the future but for right now I’m glad she got a small dose of how much group fitness classes has helped me. 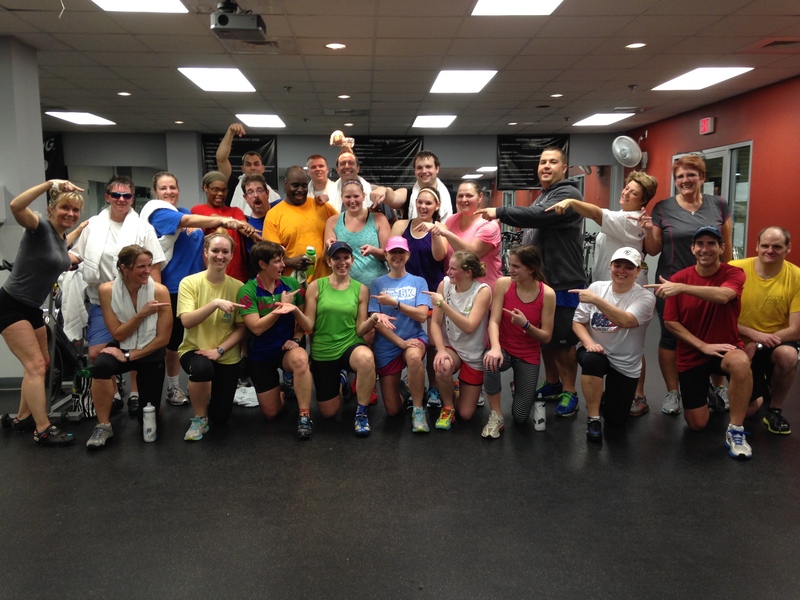 What is your favorite group fitness class? 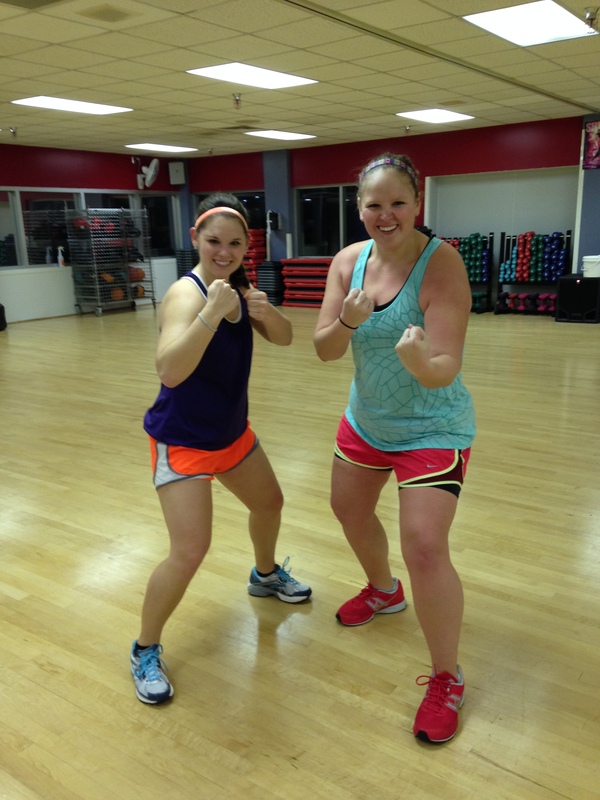 This entry was posted in Workouts by thegogirlblog. Bookmark the permalink. You are looking amazing! That last picture is so cute! You look fabulous! My favorite class is either Body Combat or yoga! Spin, definitely spin. I’d say Turbo Kickboxing, but I am horrible at following those directions. At least on the bike, I can just keep moving my legs and no one will know I have no idea what’s going on 😉 In TKB, it is too obvious when I’m even a half step behind. It doesn’t stop me from taking the class, it’s just a good thing I don’t take myself too seriously!